I used a medium sized basin which I lined with grease proof paper before adding the cake mixture. When the cake was cooked and cooled I cut it into 3 layers and levelled the base and filled with butter cream and jam and then covered in butter cream and placed in the freezer to chill. Meanwhile I rolled out the pink icing I had previously coloured and covered the cake. 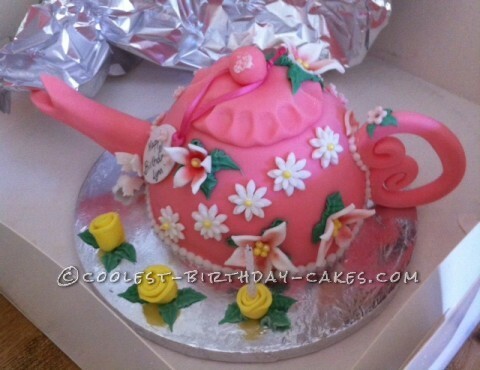 I had to do this first because I needed to do the handle and spout the right size for the cake. Next I added some flower paste to the left over pink icing just enough to make the spout, handle and lid I shaped these and set aside to harden overnight. I now cut out all the flowers and butterflies and made a tag and set these aside. The next day using royal icing I attached the handle and the spout and then piped around the handle spout and base of the cake in white icing with some green royal icing I pipe iced the leaves and then attached the flowers I then attached the Daisy’s finally I attached the butterflies. To finish off I attached small yellow edible balls to the centre of the flowers. I then wrote a message on the tag and threaded some pink ribbon through the hole on the tag and placed the ribbon over the ball on the lid.